THANKS TO ALL MYMONEYBOOK IS IN THE BEST APPS OF THE CATEGORY. IF YOU LIKE THE APP AND WANT HELP US TO IMPROVE IT, PLEASE RATE IT WITH 5 STAR IN THE STORE. 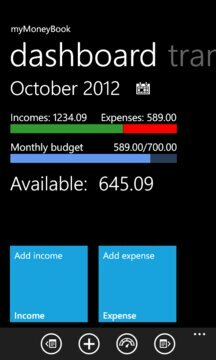 Manage your expenses quickly and easily. 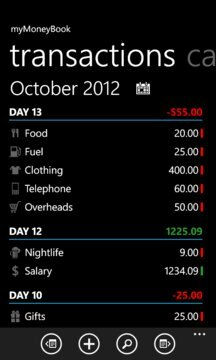 Enter your daily receivables/payables in just few steps and set a monthly budget to track your spending. Customize the categories to suit your needs. Add the tiles to the start screen to streamline operations. Data backup via OneDrive and csv export!! TRIAL: limited to 10 transactions and data backup not enabled. If you have any problems please contact support instead of writing a bad review.